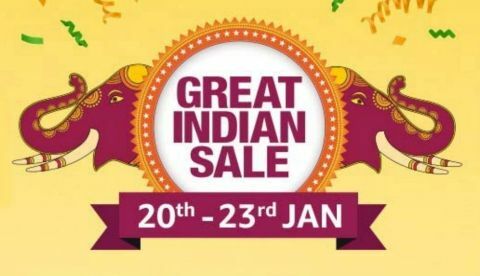 The Amazon Great Indian sale has kicked off for Prime members today. The sale will open for all members from tomorrow January 20. Here’s take a look at the top 5 smartphone deals of the day 1. The Amazon Great Indian sale has just begun for Prime members. The e-commerce platform exclusively opened the sale for Prime Members 12 hours prior. The sale is featuring discounts and offers on plenty of products across various categories. Amazon has also collaborated with HDFC bank and offering up to 10% discount to buyers who will make payment through the bank’s debit or credit card. So, let’s begin with taking a look at some of the best deals Amazon has on smartphones today. The RealMe selfie-centric smartphone “U1” is up for sale today on Amazon. The phone is available at a discounted price of Rs 10,999 for the 3GB/32GB variant. One can also get an extra 10% discount on making payment via an HDFC bank card. Check out the deal here. Xiaomi’s budget device Redmi 6A can be bought today for as low as Rs 5,499 that includes HDFC discount as well. The phone has a 13MP camera at the back and is powered by a MediaTek Helio A22 processor. Check out the deal here. Apple’s iPhone X, which was launched last to last year at a price tag of Rs 91,900 is now available at a discounted price of Rs 74,999. The phone is powered by the Apple A11 Bionic chipset and comes with a dual 12MP camera set up at the back. Check out the deal here. Huawei’s P20 Lite that comes with a dual camera set up at the back along with a 24MP unit on the front is now can be bought at Rs 12,999 down from its MRP of Rs 21,990. Check out the deal here. The Xiaomi Redmi Y2 that was released in India at an MRP of Rs 10,499 is now available on Amazon at a discounted price of Rs 7,999. One can grab this device for as low as Rs 7,200 (appx). Check out the deal here. micromax captures the indian smartphone market from samsung, can it stand globally?